This is a distinguished Irish surname. Deriving from the ancient Gaelic spelling of O'hAinle", it originates from the word "ainle", meaning beauty or grace. Traditionally, Irish family names are taken from the heads of tribes, revered elders, or some illustrious warrior, and are usually prefixed by O', meaning grandson or male descendant of, or Mac, denoting son of. They are often extremley 'robust', and unlike this surname, rarely physically complimentary. The O' Hanley's originated on the banks of the River Shannon in the county of Roscommon, where the place Doohyhanly is named after them. The sept was a branch of the royal house of O'Conor, of which Rory O'Conor was the last High King of Ireland (1166 - 1175). In Petty's famous 'Census' of Ireland in 1659, the surname is confined to County Roscommon, but thereafter a family of the name established itself in County Cork, where O'Hanley was variously spelt Hanley, Henley, Henly, Hendley and Henely, without the prefix of O'. A notable early bearer of the name was Samuel O'Hanley, the bishop of Dublin (1096 - 1111), whilst nine centuries later on March 13th 1846, Martin Hanley, aged 22, embarked from Liverpool on the ship "Liverpool" bound for New York. He was among several of the name to enter America as famine immigrants during the years 1846 - 1851. 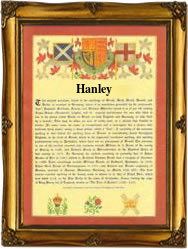 The Hanley coat of arms is a green shield with a silver boar passant, between two silver arrows barways. The first recorded spelling of the family name is shown to be that of Donal O'Hanley, and dated 1085, in the ancient ecclesiastical records of Dublin, 1022 - 1166. Throughout the centuries, surnames in every country have continued to "develop" often leading to astonishing variants of the original spelling.